From page 6 of the full text (and continued on page 7): Gender in Uganda's NAP-Ag Process (FAO). Climate change impacts all members of Ugandan society. However, systemic gender discrimination at all levels (National Planning Authority (NPA), 2015) creates a situation where men and women experience climate risks differently as they are vulnerable in different ways. Despite a recognition of the importance of promoting gender equality, as well as a commitment to address women’s and men’s different needs and constraints, actually putting this commitment into practice is not straightforward. Uganda overcame this challenge by analysing gender issues and incorporating lessons learned into the National Adaptation Plan (NAP) process for the agricultural sector. 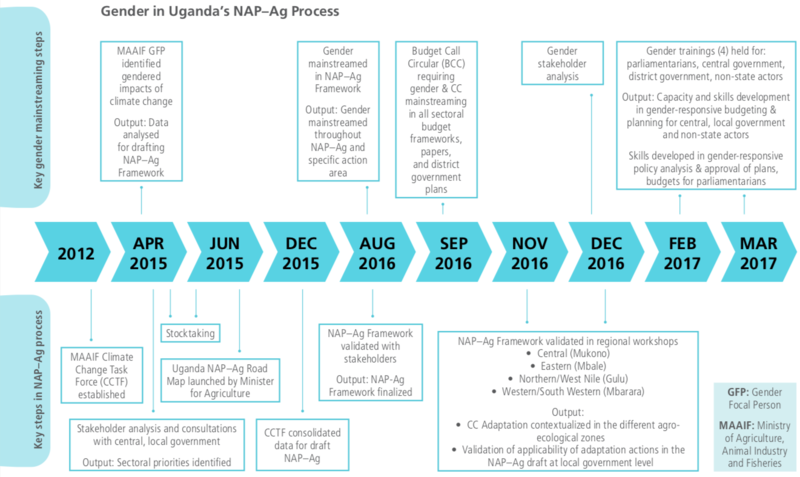 This case study* chronicles Uganda’s experiences developing a gender‑responsive National Adaptation Plan for the Agricultural Sector (NAP-Ag) and related capacity development for gender-responsive planning, budgeting and policy formulation. Lessons learned from these endeavors can provide insights for other countries who are seeking, like Uganda, to align NAP or agricultural sector NAP efforts with national goals as well as the Paris Agreement (Article 7.5), which mandates gender-responsive adaptation actions and capacity-building activities. *Download the full case study from the right-hand column. Engage a deliberate gender lens at every level to identify and analyse gender gaps and build on qualitative and quantitative evidence of gender‐based vulnerabilities and impacts. Recognize the important role of women, men and youth as change agents in agricultural adaptation, not only as vulnerable groups. Address structural gender challenges, unequal gender relations and power dynamics, including the lack of ownership of land and other production assets, unequal division of labour and inequitable decision‐making, that inhibit adaptation technologies and practices by women. Align with national gender plans andother related policies, such as finance, planning and climate change, and global climate and development goals and agreements (e.g. Paris Agreement, Sustainable Development Goals). Stipulate clear gender‐responsive actions with a costed gender-responsive budget and a gender‐responsive performance monitoring framework. Strengthen stakeholder capacity, supported by gender experts, to address gender in adaptation planning processes. Entrenched discriminatory cultural/gender norms and attitudes. Society continues to view men as powerful problem solvers and women as a weak, vulnerable target group for poverty interventions in policies. Limited appreciation of the importance of addressing gender in adaptation. The Ministry of Gender, Labour, and Social Development (MGLSD) has a mandate to support ministries, departments and agencies to address gender. However, evidence of limited requests from government stakeholders in other ministries for gender mainstreaming guidance and support shows that it is largely under-appreciated and/or accessed. Limited staff and Gender Focal Persons (GFP) capacity on gender and climate mainstreaming. The Gender Secretariat of the Ministry of Agriculture, Animal Industry and Fisheries (MAAIF); MGLSD and Climate Change Department (CCD) in MWE have conducted training for management and staff, but they still need further knowledge and skill-building (including access to tools, guidelines and checklists) to mainstream gender as they have limited capacity to screen programmes, plans and budgets with a gender and/or climate change angle. Argument that there is no budget for gender mainstreaming. The common argument of a lack of budget for gender mainstreaming is not justified as there is ample budget for climate and other research and projects implemented at the directorate levels. Wide gap between technology development and users. The technology development agenda suffers from a lack of rigorous engagement with rural users, especially women, to identify needs and priorities, which are comprehensively informed by user needs and priorities of rural users especially women. Align with international and regional commitments (e.g. NDCs, SDGs) as well as with national gender and other related legislation, policies, planning and budgeting processes and climate change. Employ a participatory approach in adaptation planning processes to capture diverse perspectives from women and men across different socio-economic and regional backgrounds and from across levels of government, including community, local and central levels. Strengthen partnerships with state and non-state actors, such as civil society or the private sector, to support gender mainstreaming and gender specific actions and cost leveraging. Operationalize acts, regulations and guidelines that address gender issues, such as budget regulations. Develop institutional/staff capacity in gender analysis and mainstreaming for government and other non-state stakeholders. FAO & UNDP. (2018). Gender and Adaptation Planning in the Agricultural Sectors: The Case of Uganda. Rome, Italy, FAO 12 pp.